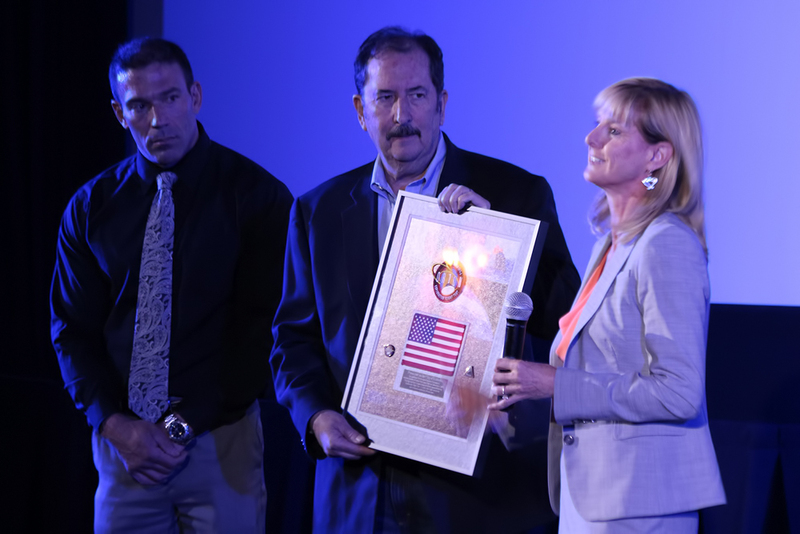 May 25, 2016 – Lockheed Martin Space Systems showed its appreciation to the city of Littleton, Colorado, and Mayor Bruce Beckman by presenting him with a flag that flew on the Orion spacecraft’s test flight. The presentation was made on Monday, May 23, during an event hosted by the Rocky Mountain section of the American Institute of Aeronautics and Astronautics (AIAA). In presenting the award, Kay Sears, Lockheed’s Vice President of Strategy and Business Development for Space Systems, noted a long and enduring partnership between Lockheed Martin and the city of Littleton which dates back to November 1955 when the Glenn L. Martin Company announced plans to build a major defense plant southwest of the city. Lockheed and Littleton are currently partnering on the construction of a new fire station for the city. The aerospace company wanted a long-term arrangement with Littleton Fire Rescue (LFR) for fire and emergency medical response to its Waterton Canyon Plant, so they shared the cost of construction and operating costs with LFR and the City of Littleton. “We can expand capabilities for both entities in a way that neither of us could afford to do separately so this is a classic example, a great example, and somewhat of a new example, of public-private partnership,” said Joe Rice, Director of Government Relations for Lockheed Martin Space Systems Company. The Littleton-based division of Lockheed Martin is the primary contractor for the Orion spacecraft. On Orion’s flight test, known as EFT-1, the spacecraft traveled around the Earth twice before splashing down in the Pacific Ocean. Since that time, engineers and technicians have analyzed the data from the flight test, as well as the capsule, in order to develop and build the best possible, human-rated spacecraft for deep space exploration. Orion will next launch atop NASA’s Space Launch System on Exploration Mission-1 (EM-1) in 2018. EM-1 will launch an uncrewed Orion spacecraft to a stable orbit beyond the moon and bring it back to Earth to demonstrate the integrated system performance of the SLS rocket and Orion spacecraft.